Have you ever skated close to the edge of destruction? Perhaps you love to snowboard, and as you slash through the snow, you suddenly realize you are nearly horizontal to the snow and you’re going nearly 20 miles an hour… Or maybe you love to surf, and know that at any moment the wave will crest and you might be crushed beneath it… Well, for metalsmiths we have a technique called “reticulation” that will send us through the same exhilarating rush of emotion and adrenaline as we ride the ragged edge where precious metals melt. First I have to discuss the science- just a little bit, I promise! 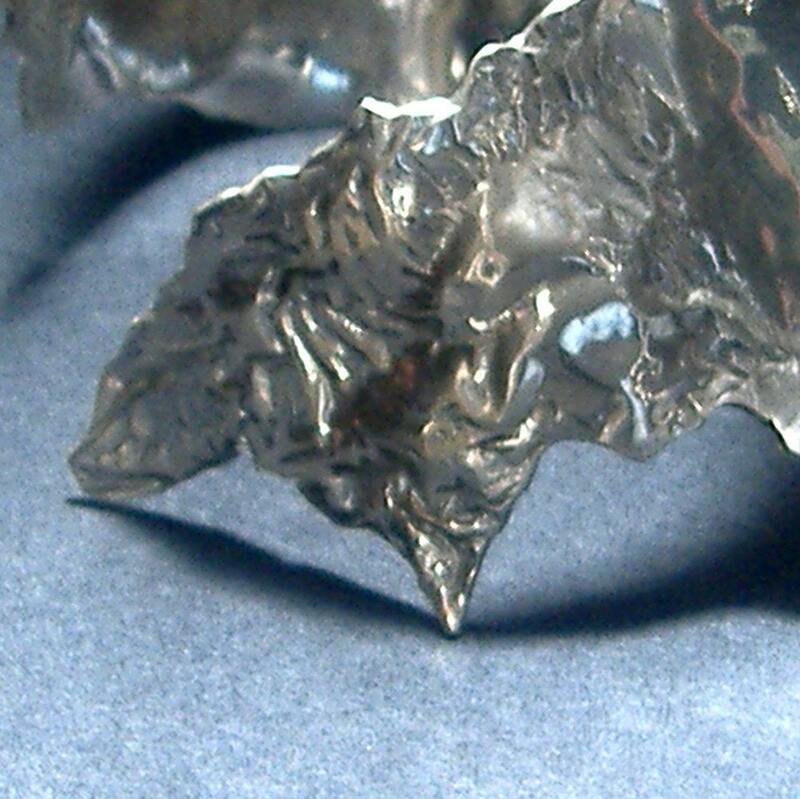 Silver is a very soft metal, which means it can only become so strong through being worked before it cracks, or breaks. Generally, it is much to soft to create any reasonable amount of structural strength. So, sometime in the 12th century in northern Germany, people started mixing other metals into molten silver to help make it stronger. The majority of the mixture, called an alloy, is silver, with the balance of the material generally consisting of copper. Now, when a silver alloy is heated with a torch, the surface of the metal becomes black as the copper of the alloy oxidizes in the heat. 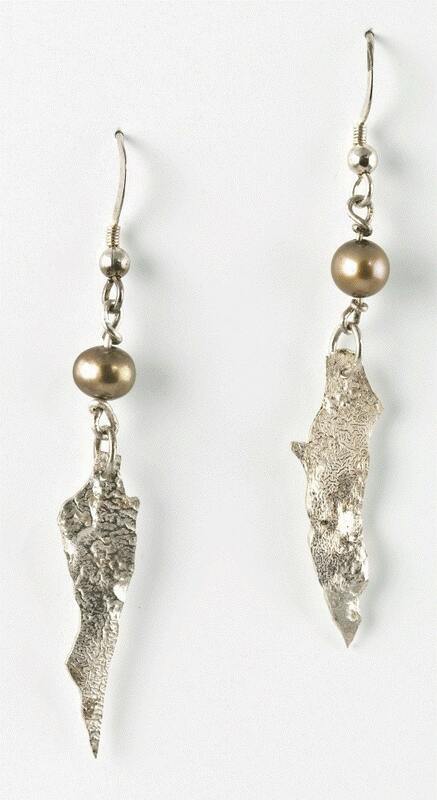 Metalsmiths use various kinds of dilute acids to remove these copper oxides, leaving a very thin layer of pure silver on the surface of the metal. The artist will continue removing copper oxides, anywhere from 5 to 50 times, which will gradually thicken the outside layer of pure silver. Pretty much rinse and repeat- for hours. Then comes the test. If the artist thinks they’re good enough, has nerves of steel, and excellent timing, they’ll continue on to the next step. 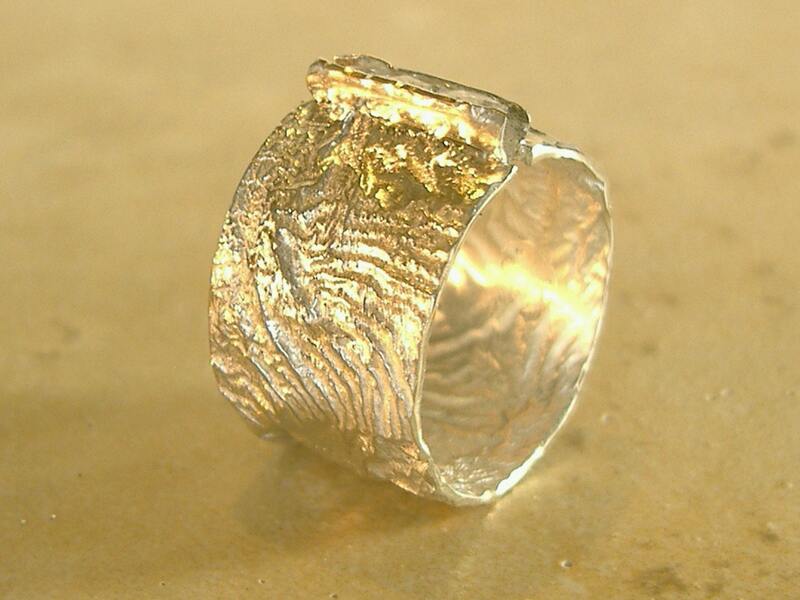 Taking the prepared sheet of silver, and a very hot torch, the metalsmith gradually moves the torch millimeters away from the pure silver surface of the metal watching carefully until- as if by magic- gorgeous wrinkled textures appear in the wake of the passing torch. Peaks! Valleys! Waves of beautiful silver! Very carefully not jumping up and down while holding a torch can be a little difficult at times. While resisting the jumping, and watching the lovely texture appear, two things are happening underneath that torch. First, the interior of the metal- the part that still has copper mixed in, is melting. It can in fact, be boiling. Second, the outside of the metal, while very close to the melting point, is about 50 degrees away from becoming a puddle. Thanks to surface tension, it is actually holding it’s shape while conforming to the suddenly moving interior alloy. Do you see the danger? Quite aside from all the hours of work wasted, the artist is narrowly avoiding liquefying an innocent, expensive, piece of silver on the workbench in the pursuit of extraordinary textures. Speaking from personal experience, managing to develop the best textures is generally where you are most likely to develop very large holes as well. However, as you can see from the accompanying pictures, the entire hours long process is worth every moment. These truly fabulous organic-looking textures cannot be achieved any other way- but only if one’s nerves are up to it! Could you do it? Do you have the patience to thicken the silver layer and the discipline to not jump up and down? Do you ALSO have the nerves to move the torch, while not melting $100 of silver in to a puddle? Could you do it in gold? Adrenaline junkies take notice: there’s a new horizon yet to be explored! So, when are you going to show us something in reticulated 14ct gold? Or, maybe even a Platinum alloy? Time to be even more adventurous, yes? 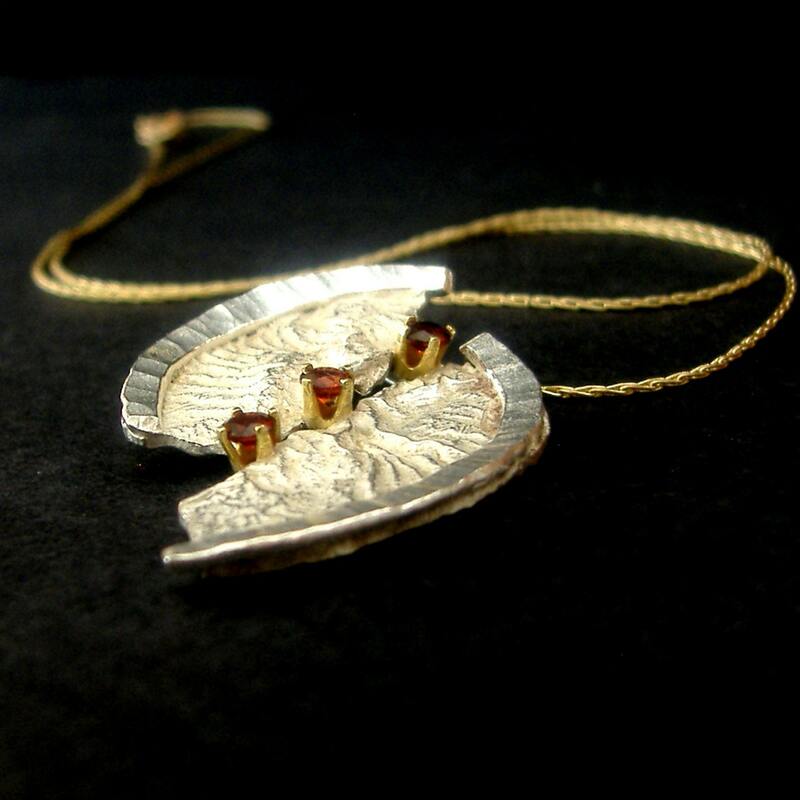 The textures you show in reticulated sterling silver are wonderful. Is reticulation possible in the tarnish resistant Argentium alloy as well? Yes, I will be posting something soon that has been created in reticulated 14 Karat gold. As far as I know, the Germanium content of Argentium Silver doesn’t lend itself to this method. Germanium is highly tarnish resistant, even under open flame, so I don’t think the build up of exterior fine silver would be possible. Amazing work. I have never seen this done before!